In its proportions and fluid curves, Renault CAPTUR evokes movement and lightness, yet at the same time displaying powerful and muscular all-terrain cues. Just as with DeZir, angles, corners and lines have given way to sensuous and natural forms. For the exterior designer, Julio Lozano, the main sources of inspiration were athletes and radical sports. "In designing CAPTUR, I began with the image of a sprinter on the starting blocks, his muscles tensed, and the energy unleashed when the starting pistol is fired," he explains. The design also references equipment such as helmets, gloves and other protective gear used in radical sports, combining high technology with sophistication and lightness. 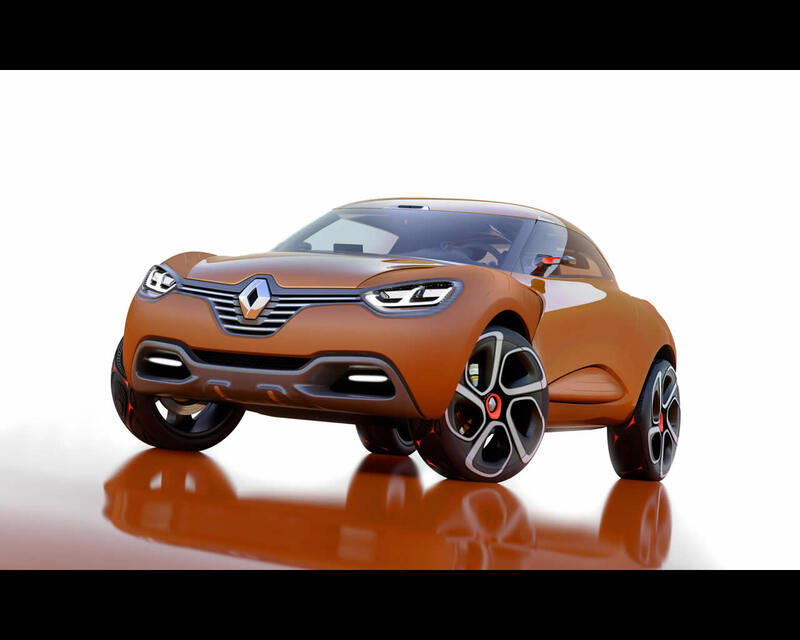 Renault CAPTUR adopts the new frontal identity first presented by DeZir. As with DeZir, this identity has as its centrepiece a large Renault logo, set vertically against a dark surface so as to stand out as clearly as possible. Substantial, matt-finished wings reinforce the design’s visual strength. LEDs relay the direction indicator signal in a wave effect running the whole length of the vehicle. 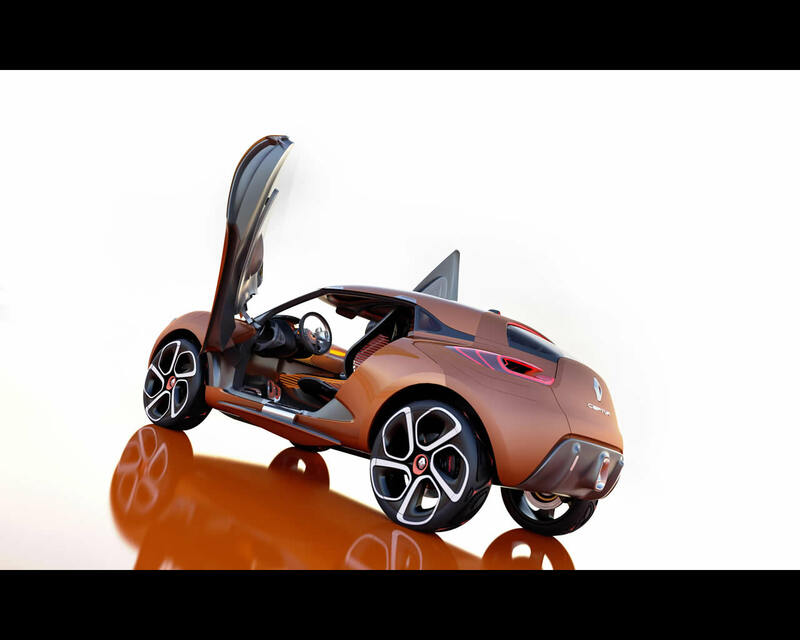 Renault CAPTUR is fitted with a hard convertible top which, once removed, reveals a carbon fibre framework. CAPTUR can thus transform itself from a coupé to a convertible, from an urban vehicle to an off-roader, while its overall sporty appeal is reinforced by its butterfly doors and big tyres fitted to 22-inch black and white rims. The orange theme has been carried over to the cabin which also features fluorescent highlights picked out by a constant stream of light. "My main sources of inspiration were the human body, outdoor sports and urban styling," explains the colour and trim designer, Kana Watanabe. 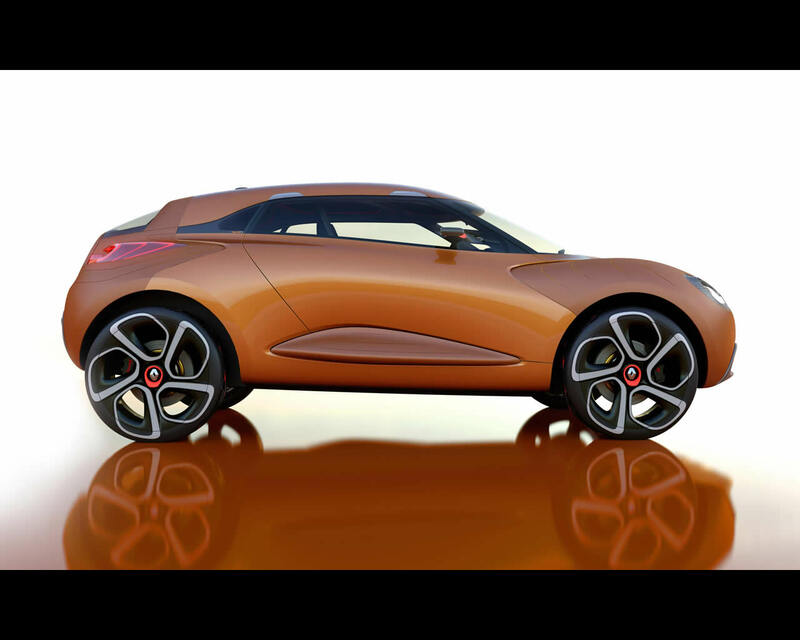 "I wanted CAPTUR to radiate warmth and dynamism." 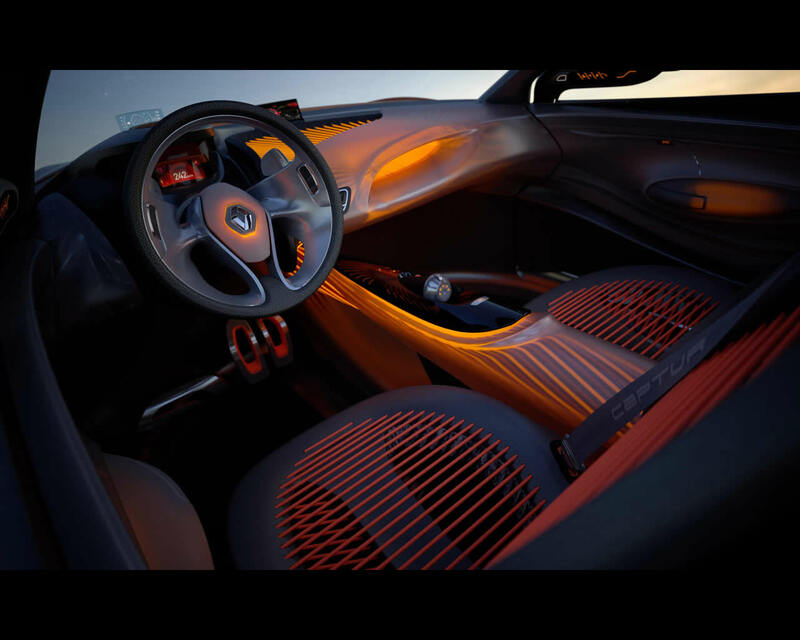 The impression of lightness expressed by the exterior is dominant here, too, with the front seats attached to the centre console as if suspended in mid air. The passenger compartment is restrained with no superfluous equipment. Innovative and ingenious materials have been employed, allowing the designers to play with light and optical effects. "The whole of the interior is designed around this network of stretched elastic ropes which bring to mind the worlds of 3 sailing or mountain climbing, They use graphics and light to bring rhythm to the overall design and reinforce the dynamic feel of the vehicle while also ensuring a lighter feel inside the cabin," explains the interior designer, Magali Gouraud-Borgers. 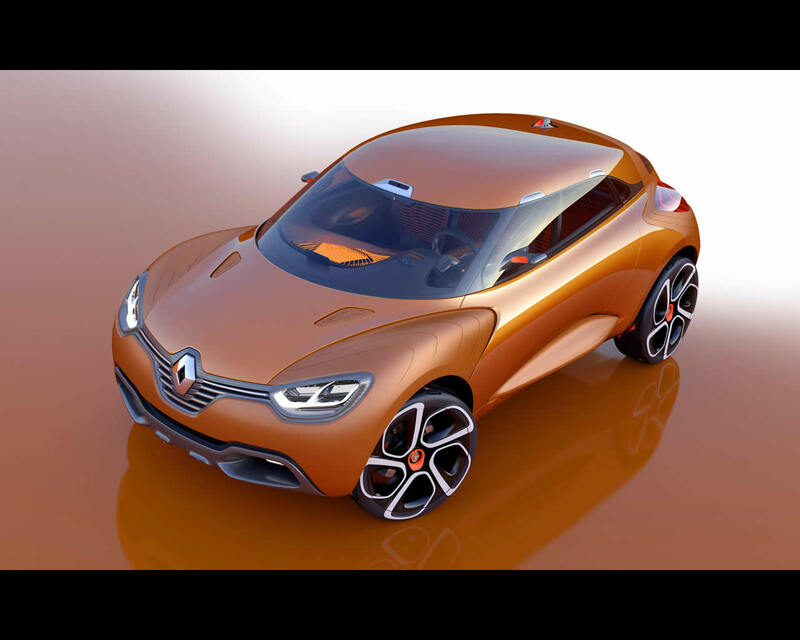 Renault CAPTUR makes use of the Energy dCi 160 twin-turbo engine-concept, developed from the new Energy dCi 130. Downsizing is a key element in Renault’s strategy to meet its declared objective of being Europe’s leading automaker with regard to CO2 emissions. The range of electric vehicles will run alongside internal-combustion engined models that combine performance with reduced fuel consumption. Energy dCi 160 twin-turbo fits perfectly within this strategy. It produces 118kW (160hp) from a capacity of 1.6 litres – that’s a specific power output of 100hp per litre. Peak torque (380Nm) is available from as low as 1,750rpm, giving powerful acceleration from low revs, as well as refined performance under all driving conditions. Paired with a dual clutch EDC gearbox, this driveline promises genuinely enjoyable driving with CO2 emissions of 99 g per kilometre. Renault CAPTUR’s performance is further enhanced by the RX2®, a novel system that improves traction at low speeds. Should one of the two driven wheels lose traction, this entirely new mechanical self-locking differential transfers all or part of the engine’s torque to the wheel with the most grip. Driving on slippery roads and tracks thus remains smooth and effortless.